The joys of having your own washer and dryer are plentiful. It seems like a great gift, especially if you have ever had to share a laundry room with other people. Unfortunately, if you live in an apartment building or complex, you will need to learn apartment building laundry etiquette. If everybody who lives there would follow some common-sense apartment laundry room tips, the laundry experience would improve greatly. Be Respectful of Time: Just because you are a night owl doesn’t mean the other folks living in your building keep the same hours. Be respectful of quiet times. Many laundry rooms will post hours, such as no doing laundry between the hours of 10 p.m. and 7 a.m. Conforming to these hours is one important aspect of apartment laundry room etiquette. Clean Up After Yourself: It is important to remember that the common laundry area of your apartment building does not come equipped with a maid. No one is there just for the pleasure of cleaning up after you. If you make a mess of any kind, clean it up. This isn’t just apartment laundry etiquette; this is common courtesy when you share your living space with others. Don’t Hog the Machines: Busy lives and a strong desire to avoid doing the laundry can lead to a full hamper come laundry day. Don’t make your neighbors wait because you are using all of the machines. They won’t care if you are in a hurry; your neighbors will just think you are rude. This is one of those apartment laundry room tips that can help you to maintain a nice, friendly relationship with your neighbors. Your ability to share and “play nice” will keep you in their good graces. Keep Track of Time: Whatever you do, don’t leave your laundry in the machines and forget about it. No one wants to mess with your unmentionables, but if they are left in the dryer well past the end of the dry cycle, they will no doubt be removed. Your pile of nice, clean laundry will be left sitting in a pile, getting all wrinkled and maybe even lost. And you will only have yourself to blame. Give the Benefit of the Doubt: If you are the person who wants to do laundry but somebody else has clothes sitting in the machine, be nice. Don’t assume they are ignorant and proceed to toss their clothes on the floor. Give them 15 minutes. They may have temporarily lost track of time or gotten a phone call. If you wait and they still haven’t come back to take care of their clothes, then you can move them. Apartment building laundry etiquette 101 says to be nice! Empty the Lint Trap: It doesn’t matter where you are drying your clothes, at the laundromat or your shared laundry space – it plain stinks to pay money to dry your clothes and find them still wet at the end of the cycle. Emptying the lint trap is a simple task that takes no real time. Do it for yourself, and be kind enough to check it at the end of your load. Your brand-new, fluffy towels can leave a lot of lint behind. Don’t Smoke in the Laundry Room: Most apartments will have a no-smoking rule in the common areas. Don’t be that person who can’t pay attention to apartment laundry room etiquette and decides to sneak a smoke while you are waiting. Your neighbors do not want their laundry to smell like your cigarette smoke. Overloading is a No-No: Just because you have a lot of laundry doesn’t mean it is OK to overload machines so you can get it done quicker. 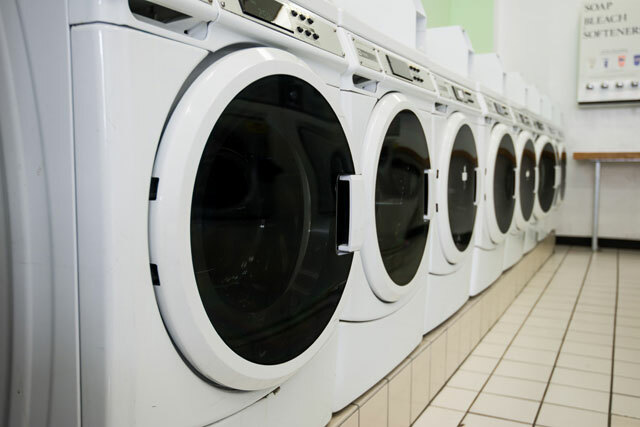 Continual overloading of washers and dryers will cause equipment failures, and broken machines don’t get the laundry done. Be Careful What You Put in the Dryer: Make sure you have checked your pockets for pens, gum, and crayons. They can make a mess inside the dryer that will continue to destroy laundry well after yours is done. Rubber-soled shoes don’t belong in the dryer, either. They can damage the drum of the dryer, make an insane amount of noise, and potentially start a fire. Use Common Courtesy: If you wouldn’t want someone to do something in your home, don’t do it in a shared space. Be thoughtful of your neighbors, and they will probably return the favor. Apartment laundry etiquette could just as easily be called apartment living etiquette.